"That He might sanctify the people with His own blood," Christ "suffered without the gate." Hebrews 13:12. For transgression of the law of God, Adam and Eve were banished from Eden. Christ, our substitute, was to suffer without the boundaries of Jerusalem. He died outside the gate, where felons and murderers were executed. Full of significance are the words, "Christ hath redeemed us from the curse of the law, being made a curse for us." Galatians 3:13. As Jesus passed the gate of Pilate's court, the cross which had been prepared for Barabbas was laid upon His bruised and bleeding shoulders. Two companions of Barabbas were to suffer death at the same time with Jesus, and upon them also crosses were placed. The Saviour's burden was too heavy for Him in His weak and suffering condition. Since the Passover supper with His disciples, He had taken neither food nor drink. He had agonized in the garden of Gethsemane in conflict with satanic agencies. He had endured the anguish of the betrayal, and had seen His disciples forsake Him and flee. He had been taken to Annas, then to Caiaphas, and then to Pilate. From Pilate He had been sent to Herod, then sent again to Pilate. From insult to renewed insult, from mockery to mockery, twice tortured by the scourge,--all that night there had been scene after scene of a character to try the soul of man to the uttermost. Christ had not failed. He had spoken no word but that tended to glorify God. All through the disgraceful farce of a trial He had borne Himself with firmness and dignity. But when after the second scourging the cross was laid upon Him, human nature could bear no more. He fell fainting beneath the burden. Of the multitude that followed the Saviour to Calvary, many had attended Him with joyful hosannas and the waving of palm branches as He rode triumphantly into Jerusalem. But not a few who had then shouted His praise, because it was popular to do so, now swelled the cry of "Crucify Him, crucify Him." When Christ rode into Jerusalem, the hopes of the disciples had been raised to the highest pitch. They had pressed close about their Master, feeling that it was a high honor to be connected with Him. Now in His humiliation they followed Him at a distance. They were filled with grief, and bowed down with disappointed hopes. How were the words of Jesus verified: "All ye shall be offended because of Me this night: for it is written, I will smite the shepherd, and the sheep of the flock shall be scattered abroad." Matthew 26:31. Had they known that they were putting to torture One who had come to save the sinful race from eternal ruin, they would have been seized with remorse and horror. But their ignorance did not remove their guilt; for it was their privilege to know and accept Jesus as their Saviour. Some of them would yet see their sin, and repent, and be converted. Some by their impenitence would make it an impossibility for the prayer of Christ to be answered for them. Yet, just the same, God's purpose was reaching its fulfillment. Jesus was earning the right to become the advocate of men in the Father's presence. A higher power than Pilate or the Jews had directed the placing of that inscription above the head of Jesus. In the providence of God it was to awaken thought, and investigation of the Scriptures. The place where Christ was crucified was near to the city. Thousands of people from all lands were then at Jerusalem, and the inscription declaring Jesus of Nazareth the Messiah would come to their notice. It was a living truth, transcribed by a hand that God had guided. 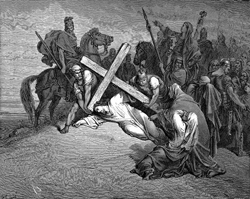 In the sufferings of Christ upon the cross prophecy was fulfilled. Centuries before the crucifixion, the Saviour had foretold the treatment He was to receive. He said, "Dogs have compassed Me: the assembly of the wicked have enclosed Me: they pierced My hands and My feet. I may tell all My bones: they look and stare upon Me. They part My garments among them, and cast lots upon My vesture." Psalm 22:16-18. The prophecy concerning His garments was carried out without counsel or interference from the friends or the enemies of the Crucified One. To the soldiers who had placed Him upon the cross, His clothing was given. Christ heard the men's contention as they parted the garments among them. His tunic was woven throughout without seam, and they said, "Let us not rend it, but cast lots for it, whose it shall be." In another prophecy the Saviour declared, "Reproach hath broken My heart; and I am full of heaviness: and I looked for some to take pity, but there was none; and for comforters, but I found none. They gave Me also gall for My meat; and in My thirst they gave Me vinegar to drink." Psalm 69:20, 21. To those who suffered death by the cross, it was permitted to give a stupefying potion, to deaden the sense of pain. This was offered to Jesus; but when He had tasted it, He refused it. He would receive nothing that could becloud His mind. His faith must keep fast hold upon God. This was His only strength. To becloud His senses would give Satan an advantage. "If Thou be the Son of God," they said, "come down from the cross." "Let Him save Himself, if He be Christ, the chosen of God." In the wilderness of temptation Satan had declared, "If Thou be the Son of God, command that these stones be made bread." "If Thou be the Son of God, cast Thyself down" from the pinnacle of the temple. Matthew 4:3, 6. And Satan with his angels, in human form, was present at the cross. The archfiend and his hosts were co-operating with the priests and rulers. The teachers of the people had stimulated the ignorant mob to pronounce judgment against One upon whom many of them had never looked, until urged to bear testimony against Him. Priests, rulers, Pharisees, and the hardened rabble were confederated together in a satanic frenzy. Religious rulers united with Satan and his angels. They were doing his bidding. To Jesus in His agony on the cross there came one gleam of comfort. It was the prayer of the penitent thief. Both the men who were crucified with Jesus had at first railed upon Him; and one under his suffering only became more desperate and defiant. But not so with his companion. This man was not a hardened criminal; he had been led astray by evil associations, but he was less guilty than many of those who stood beside the cross reviling the Saviour. He had seen and heard Jesus, and had been convicted by His teaching, but he had been turned away from Him by the priests and rulers. Seeking to stifle conviction, he had plunged deeper and deeper into sin, until he was arrested, tried as a criminal, and condemned to die on the cross. In the judgment hall and on the way to Calvary he had been in company with Jesus. He had heard Pilate declare, "I find no fault in Him." John 19:4. He had marked His godlike bearing, and His pitying forgiveness of His tormentors. On the cross he sees the many great religionists shoot out the tongue with scorn, and ridicule the Lord Jesus. He sees the wagging heads. He hears the upbraiding speeches taken up by his companion in guilt: "If Thou be Christ, save Thyself and us." Among the passers-by he hears many defending Jesus. He hears them repeat His words, and tell of His works. The conviction comes back to him that this is the Christ. Turning to his fellow criminal he says, "Dost not thou fear God, seeing thou art in the same condemnation?" The dying thieves have no longer anything to fear from man. But upon one of them presses the conviction that there is a God to fear, a future to cause him to tremble. And now, all sin-polluted as it is, his life history is about to close. "And we indeed justly," he moans; "for we receive the due reward of our deeds: but this Man hath done nothing amiss." For long hours of agony, reviling and mockery have fallen upon the ears of Jesus. As He hangs upon the cross, there floats up to Him still the sound of jeers and curses. With longing heart He has listened for some expression of faith from His disciples. He has heard only the mournful words, "We trusted that it had been He which should have redeemed Israel." How grateful then to the Saviour was the utterance of faith and love from the dying thief! While the leading Jews deny Him, and even the disciples doubt His divinity, the poor thief, upon the brink of eternity, calls Jesus Lord. Many were ready to call Him Lord when He wrought miracles, and after He had risen from the grave; but none acknowledged Him as He hung dying upon the cross save the penitent thief who was saved at the eleventh hour. The thieves crucified with Jesus were placed "on either side one, and Jesus in the midst." This was done by the direction of the priests and rulers. Christ's position between the thieves was to indicate that He was the greatest criminal of the three. Thus was fulfilled the scripture, "He was numbered with the transgressors." Isaiah 53:12. But the full meaning of their act the priests did not see. As Jesus, crucified with the thieves, was placed "in the midst," so His cross was placed in the midst of a world lying in sin. And the words of pardon spoken to the penitent thief kindled a light that will shine to the earth's remotest bounds. And now the Lord of glory was dying, a ransom for the race. In yielding up His precious life, Christ was not upheld by triumphant joy. All was oppressive gloom. It was not the dread of death that weighed upon Him. It was not the pain and ignominy of the cross that caused His inexpressible agony. Christ was the prince of sufferers; but His suffering was from a sense of the malignity of sin, a knowledge that through familiarity with evil, man had become blinded to its enormity. Christ saw how deep is the hold of sin upon the human heart, how few would be willing to break from its power. He knew that without help from God, humanity must perish, and He saw multitudes perishing within reach of abundant help. In that thick darkness God's presence was hidden. He makes darkness His pavilion, and conceals His glory from human eyes. God and His holy angels were beside the cross. The Father was with His Son. Yet His presence was not revealed. Had His glory flashed forth from the cloud, every human beholder would have been destroyed. And in that dreadful hour Christ was not to be comforted with the Father's presence. He trod the wine press alone, and of the people there was none with Him. When the darkness lifted from the oppressed spirit of Christ, He revived to a sense of physical suffering, and said, "I thirst." One of the Roman soldiers, touched with pity as he looked at the parched lips, took a sponge on a stalk of hyssop, and dipping it in a vessel of vinegar, offered it to Jesus. But the priests mocked at His agony. When darkness covered the earth, they had been filled with fear; as their terror abated, the dread returned that Jesus would yet escape them. His words, "Eloi, Eloi, lama sabachthani?" they had misinterpreted. With bitter contempt and scorn they said, "This man calleth for Elias." The last opportunity to relieve His sufferings they refused. "Let be," they said, "let us see whether Elias will come to save Him." The spotless Son of God hung upon the cross, His flesh lacerated with stripes; those hands so often reached out in blessing, nailed to the wooden bars; those feet so tireless on ministries of love, spiked to the tree; that royal head pierced by the crown of thorns; those quivering lips shaped to the cry of woe. And all that He endured--the blood drops that flowed from His head, His hands, His feet, the agony that racked His frame, and the unutterable anguish that filled His soul at the hiding of His Father's face--speaks to each child of humanity, declaring, It is for thee that the Son of God consents to bear this burden of guilt; for thee He spoils the domain of death, and opens the gates of Paradise. He who stilled the angry waves and walked the foam-capped billows, who made devils tremble and disease flee, who opened blind eyes and called forth the dead to life,--offers Himself upon the cross as a sacrifice, and this from love to thee. He, the Sin Bearer, endures the wrath of divine justice, and for thy sake becomes sin itself. When the loud cry, "It is finished," came from the lips of Christ, the priests were officiating in the temple. It was the hour of the evening sacrifice. The lamb representing Christ had been brought to be slain. Clothed in his significant and beautiful dress, the priest stood with lifted knife, as did Abraham when he was about to slay his son. With intense interest the people were looking on. But the earth trembles and quakes; for the Lord Himself draws near. With a rending noise the inner veil of the temple is torn from top to bottom by an unseen hand, throwing open to the gaze of the multitude a place once filled with the presence of God. In this place the Shekinah had dwelt. Here God had manifested His glory above the mercy seat. No one but the high priest ever lifted the veil separating this apartment from the rest of the temple. He entered in once a year to make an atonement for the sins of the people. But lo, this veil is rent in twain. The most holy place of the earthly sanctuary is no longer sacred. All is terror and confusion. The priest is about to slay the victim; but the knife drops from his nerveless hand, and the lamb escapes. Type has met antitype in the death of God's Son. The great sacrifice has been made. The way into the holiest is laid open. A new and living way is prepared for all. No longer need sinful, sorrowing humanity await the coming of the high priest. Henceforth the Saviour was to officiate as priest and advocate in the heaven of heavens. It was as if a living voice had spoken to the worshipers: There is now an end to all sacrifices and offerings for sin. The Son of God is come according to His word, "Lo, I come (in the volume of the Book it is written of Me,) to do Thy will, O God." "By His own blood" He entereth "in once into the holy place, having obtained eternal redemption for us." Hebrews 10:7; 9:12.